Glaze your eyes over these bad boys, because they’re damn tasty, and worth every glorious calorie. It’s no mere coincidence that these hand-size sugar rings fit snuggly into our delicate palms. A sweet and delicious gift from the gods, that guarantees a happy belly. But where oh where to find Australia’s best holey creations? We’re so glad you asked. Lucky for you, we volunteered to taste test all the icings, all the fillings, all the toppings and all of the glazes. So here it is, your definitive list of our nation’s best doughnuts. 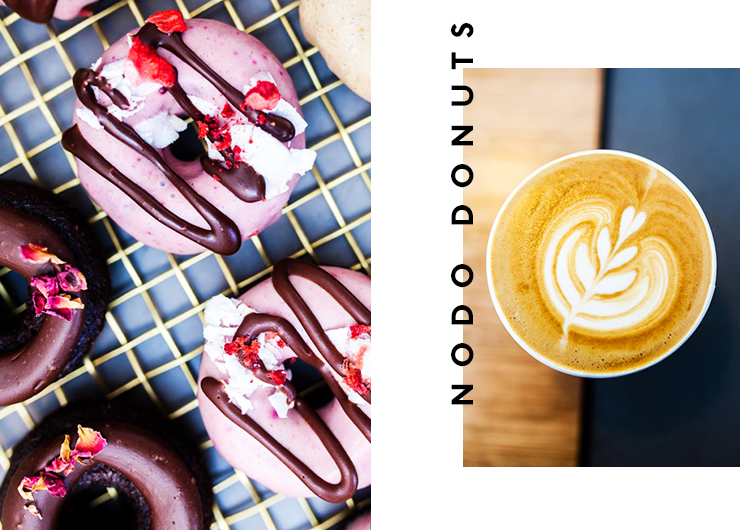 Top Dup has long been supplying the cafes of Perth with their fried dough goods and now, these legends have opened their own bakery. Jump on the matcha bandwagon that has taken over the Perth foodie scene and order up their white choc and matcha doughie with brown rice crumb. Also, doughnut toasties are a thing here. Need we say more? Get your slightly naughty fried fixture from MOP; yes team, we’re talking about spiked donuts. Because we all know that when two great things (cocktails and donuts) come together it just makes sense to combine them into one mega-dessert. Especially when the fillings include caramel Baileys and Frangelico honeycomb, or our fave, the espresso martini. Chu (aka Perth’s best bakery) is a master of the staple stuffings. Lovers of tradition can safely indulge and sink your teeth into a tasty salted caramel or jam filled donut. But just so you know, it’s the Boston cream dough balls that are working up quite a sweet tooth following around our western shores. Shout out to Mary Street Bakery for teasing us (and our potential summer bods) with their delicious AF deep fried treats. Yep, there’s a reason their salted caramel and killer lemon maple cream donuts are pretty much our nation’s pride, packing more stuffing than a Kardashian booty. Oh yes, we went there. A laneway doughnut shop has never been a bad idea. Take Shortstop who have been churning out soft and chewy edible halos of sweet, sweet goodness. Think all the glazes, all the icing, all the fillings, and all the toppings. You’ll get one helluva sugar hit with the coffee infused cake donut, topped with an espresso glaze, toasted pecan and cinnamon drizzle. Sometimes life just gets it so right and this is one of those times. It’s no surprise that the mastermind behind the doozy showcase of dough goodness at Cobb Lane is Matt Forbes. If staring into a sea of donuts has always been your dream, this is one place you should be hitting up, STAT. Plus, you’re guaranteed to score some serious #foodporn moments with these pillowy and oozy bad boys. Go for the coconut and guava jam, or salted caramel. And there’s no doubt you’ll be going for an entire box of these, they’re well worth the calories. RIP to any prospect of having abs. Why? Because pimped out doughnuts, that’s why. And we almost can’t handle so much deliciousness in one place (kiiiiiiidding, we looove it), with flavours like tiramisu, crumble, PBJ, apple cider, cookie cream, pistachio and matcha mallow. 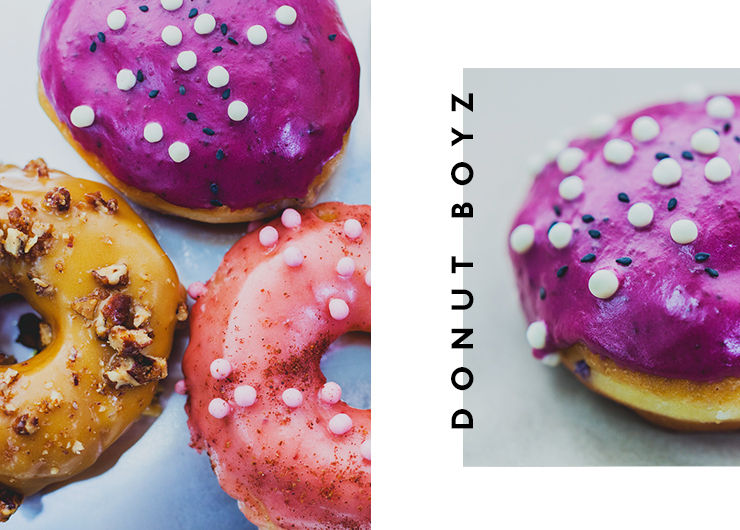 It’s hard to find anyone that loves donuts more than us but we’ve definitely met our match with DonutBoyz. These guys are all about variety, and we tend to agree (in other words, keep ‘em coming). Preferably with banana glaze, chocolate buttercream and cinnamon sugar. And don’t forget the chocolate ganache and toasted marshmallow. Let’s be honest, you’re getting both. Ask anyone about the handmade buttermilk Jam Factory donuts and they’ll say these sinkers are top notch (we can confirm this). These sweet pouches are made on the spot and have a serious rep of melting in your mouth. You’re going to want to hit up the apple and rhubarb more than once. 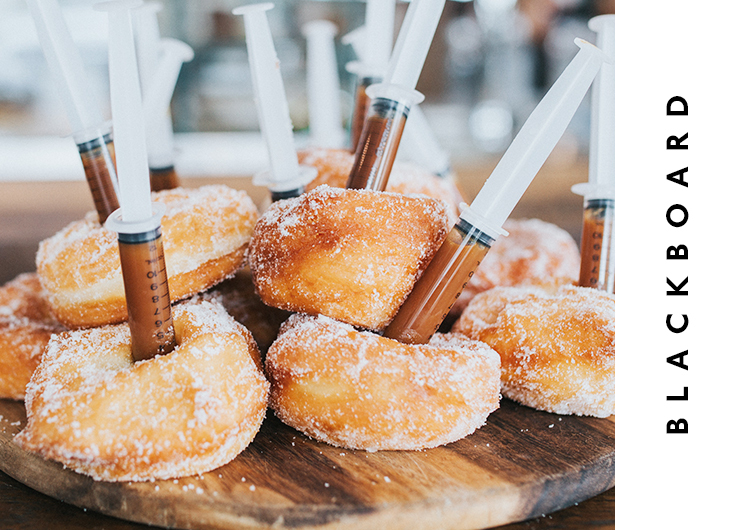 Everybody knows injectable doughy rings are where it’s at so get ready to inject a whole lot of happiness into your glaze-craving soul. Yep, there sure isn’t any better feeling than sinking your teeth into a doughnut filled with so much caramel you can practically feel the sugar oozing through your veins. The instafamous spongy delights at Paddock Bakery are well worth the hype. If you can imagine your dream donut (looks good doesn’t it? ), these are those IRL. Perfectly soft, stuffed with a silky filling and topped with crumble, you can’t say no to these glorious little doughies. And which one is the reigning champion? The S'mores doughnut is a semi-sourdough doughnut with a molten gooey marshmallow pocket in the centre, dipped in a chocolate glaze & topped with a Graham cracker crumble. Like we said, you can’t say no to these. Long live Grumpy Donuts. The carbalicious rings here are doing quite the opposite of making Sydney peeps grumpy. Especially because these deliciously crafted donuts take the form of butter toast (cue drooling). We won’t argue against having this cheeky puff for breakfast either, after all it is butter toast. We’re all on board the Shortstop haven down at one of Sydney’s newest foodie precincts. Let’s just say, we’re not quite sure how we’ve been functioning without these deep-fried, buttery and nutty beauties. Yep, if you’re looking to get that donut fix, your go-to will be the ricotta cheesecake, decked out in all the zest and cream cheese you can imagine. Everybody’s doing Nutella donuts, but nobody is doing them like hole-in-the-wall cafe Chef And The Barista. To clarify, the dough goods here are like hazelnut clouds of sweet, sweet perfection. And that’s not even doing these babies justice. Think all the Nutella (ever) encased in deep-fried fluffiness. Case in point. You know the donuts are good here when people are driving a good 2 hours to score a handful of dough lovin’. And it’s famous (for one helluva good reason too). Serving up the golden O’s for over 60 years, there’s no doubt you’ll fall in love with their crunchy outside and steamy, plush inside (yep, so freshly made that plumes of steam rise out). We need to talk about the Byron Bay Doughnuts; crispy on the outside, delectable on the inside. And we’ll go so far as to say that you haven’t really lived, until you’ve tried a BB dough goodie. These deep-fried pastries are inked with chocolate and blackberry fillings and yes; the rumours are true, people dream about them. We do too. They’re that good. We’ll always have a soft spot for donuts because well, childhood. And now that we’re adults, well, we’ve mastered this whole kidult thing. And that means paying a regular visit to Cafe De Vilis. Because you’re never too old to down a giant strawberry donut with jam, packed with cream and topped with sprinkles. Never. First off, these guys are all for eating donuts at breakfast, and that’s the kind of mindset we can work with. And you’ll be super happy to know they also have an extensive line-up of doughie flavours that are baked (not fried) that are also gluten-free. That means we can totally eat twice as many, right? Right! It also means that it’s 100% okay to have their delicious breakfast donut of banana, natural yoghurt with maple cream cheese and caramelised pecans at every food break we have. Solid plan team! Well, it doesn’t get much better than ordering up fresh dough goodies straight out of a Kombi. And we’re in full support of these cookie dough sugared up snacks. Because what’s better than cookies reincarnated as a donut? Nothing. If you like donuts in your milkshakes, check out these delicious treats.